Another local: my beer for today is an Iron Thistle from Rahr & Sons Brewing Company. This is one of their seasonals (January-February), a Scottish-style ale. It comes in a twelve ounce bottle, and the web site shows 8% ABV and 25 IBUs. 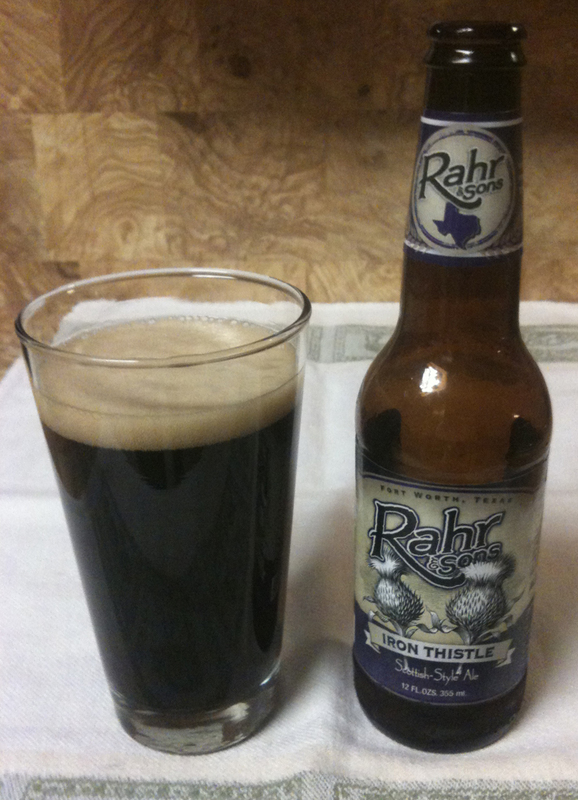 This Rahr poured with a small to medium head, which was a lighter brown. Definite chocolate in the aroma. The color is a darker brown, which lets through very little light when held up to the light. There is some nice malt and a heavier mouth feel. The higher alcohol is there in the taste and warms you up a bit. Slightly sweet. Some nice hops on the tail end that fade into a slight bitter aftertaste. Medium to full bodied. 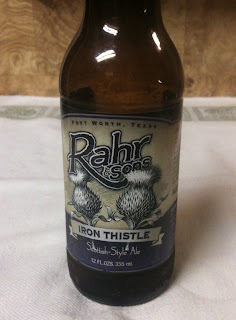 This is definitely one of my favorites that I have tried from Rahr.